Go to this link for a fantastic over view of Scorpion bay by Garrett. 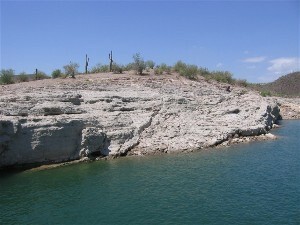 Is (Was) know as some of the best diving at lake Pleasant. New marina owner MAY let diving continue, but completion of the new marina may be a year or more in the future. 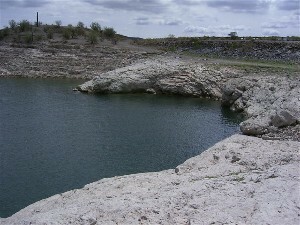 “This spot is diveable while the lake is full; early spring until mid summer. This dive site is referred to as “The Wall” because depending on the lake level a wall starting at 15-20′ drops to depths of over 60′ in some places. The wall has many crevices, overhangs and small caverns to explore. 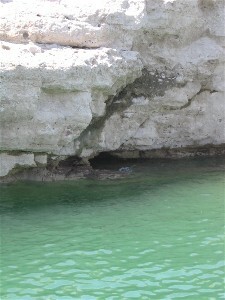 There is a sharp thermocline generally around 30-35′ where the temp and viz drop dramatically. 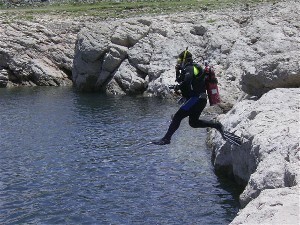 The fun thing is as the lake level drops the thermocline stays a consistent depth and you are able to explore more of the wall without having to endure the drop of temp and loss of viz, making subsequent dives unique.